On December 7, 2017, Seven-Eleven opened the environmentally, user friendly Seven-Eleven Chiyoda Nibancho Store as a flagship of these initiatives. The second such store, the Seven-Eleven Sagamihara Hashimotodai Itchome Store, opened on May 22, 2018, with renewable energy accounting for 46 percent of the store's electric power usage. 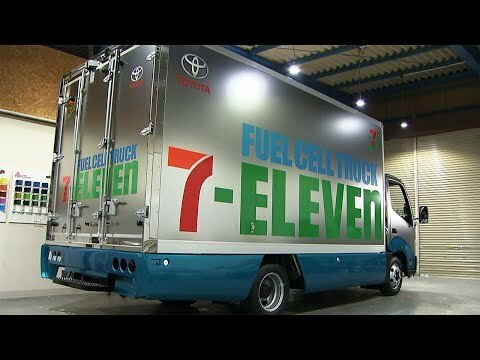 Toyota technologies and systems that use hydrogen will be introduced in stores and distribution sites, with next generation stores further using renewable energy. Two small FC trucks are intended to be introduced within the Tokyo metropolitan region in approximately spring 2019, and operations next generation stores are expected to commence in approximately autumn 2019. Building an Ethical Society and Improving Resource Sustainability Together with Customers and Business Partners. Toyota announced the Toyota Environmental Challenge 2050 in October 2015, which aims to assist in developing a sustainable society. Accordingly, Toyota is taking active measures to reduce CO2 emissions by promoting efficient energy use and alternative energy use, to address global environmental issues such as global warming, resource scarcity, and energy challenges. The current joint project aims to reduce CO2 emissions and conserve energy in Seven-Eleven store operation and distribution, and intends to support the accumulation and verification of new technologies and knowledge such as small FC trucks and FC generators. Details of the joint project are set forth below. The two companies will investigate ways to procure renewable energy and use energy efficiently, aiming to shift the energy used in stores to renewable energy and low-carbon hydrogen. Rechargeable batteries and stationary FC generators will be installed in stores and small FC trucks will be introduced for deliveries to reduce CO2 emissions. Performance, costs, durability, and CO2 reduction effects will be evaluated with the aim of promoting further deployment. An FC generator will be installed in the store, generating electricity from hydrogen for store use. Boil-off hydrogen from the hydrogen station can also potentially be used. Efforts will be made to use hydrogen energy effectively, aiming toward the use of low-carbon hydrogen. Rechargeable batteries for stable use of solar electric power, output weather dependent. When power is generated in excess of store demand, the batteries charge. When there is a shortage in power generated, the batteries discharge, raising the proportion of renewable energy use in the store. End-of-life batteries from hybrid vehicles will be used as rechargeable batteries. Controls solar power generation, FC generators, and stationary rechargeable batteries, optimally supplying power to the store according to the store's power consumption status. In addition to charging BEVs and PHEVs, the chargers can supply electric power from BEVs, PHEVs, and FCEVs to the store. When necessary, the charger can be operated with the BEMS to supply power from a BEVs, PHEVs, or FCEV connected to the charger to the store, maintaining store operations and contributing to local recovery during a disaster. The trucks, equipped with Mirai FC units, do not emit any CO2 or other substances of concern during operation. The electric power generated by the FC unit powers the truck and serves as the power source for the refrigerator unit. When stopped, the FC unit supplies generated electricity to the refrigerator/freezer unit. The truck will be equipped with an external power supply function, for high-output, high-capacity electric power supply (maximum output of 9.8 kilowatts and maximum capacity of 235 kilowatt hours) and can be used as a power source during a disaster. Effective cruising range when used in the patterns anticipated for this project. Calculated by Toyota.